‘The Hole' is a simple story of mother and son, who are farmers. Long-widowed Ka-san feels compelled to have her only son Kenji marry, to his stubborn refusal: Kenji is happy to keep things as they are. 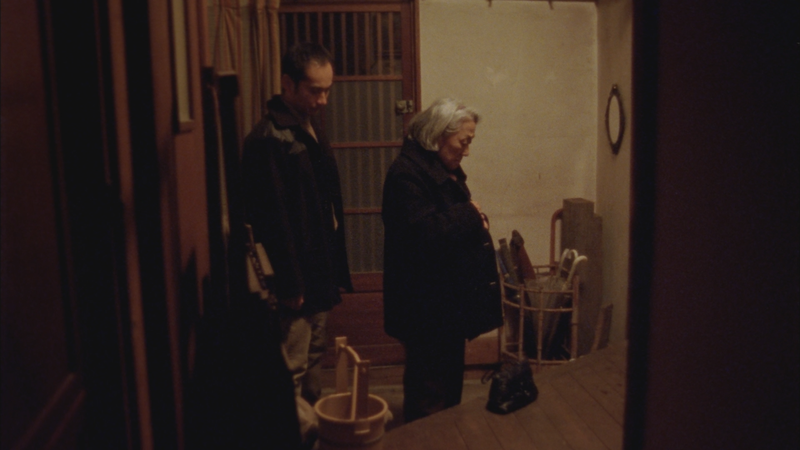 On the day they are to visit father's grave, Ka-san broaches the subject again, and during their journey Kenji begins to understand his mother's hopes and fears. The first desire in the very beginning of the project was to make a domestic film, something simple and unaffected. I was attracted to a character who is at first immature and selfish, but then gets a glimpse of someone else’s point of view, allowing him a chance to overcome himself. Whether or not this overcoming is entirely altruistic, is something I wanted to leave a little ambiguous. Why the choice of a Japanese setting? The second desire in the very beginning of the project was to make a film in Japan. Before I even thought about making films, I was watching a lot of Japanese Cinema; I was always thrilled by how Japanese films are so variegated, in terms of style, content and form. I suppose you could say it was as a small, personal pilgrimage of mine. What convinced me that this story could take place there, was that there is something very specific about the mother-son relationship in Japan; a bond very sentimental and heightened, at least in my understanding of it, more than most Asian cultures. It seemed the right place to tell that story: it invested the characters and the situation with a dramatic weight automatically. How would you have told the story differently in a Singapore setting? The very basic through-line of a selfish character overcoming himself could conceivably be told anywhere. Setting the film in Japan had, in addition to the things I mentioned above, the rural, traditional setting, which gives it a sense of timelessness; in Singapore, this would not be possible. The first thing: in Singapore, I do not think I would use marriage and mothers-and-sons. Perhaps Fathers? Helping the ineffectual Son get interviews at jobs he doesn’t see himself in? My first instinct is that it might be comical too. I am just speaking hypothetically here; in truth, if I were to properly answer this question I would have to make another film! Thank you for your compliment- I just have an interest in human relationships, and what it means to be a good human being. These are questions I ask myself; I’d like to think that these things are important, and that’s why I make films about them. What were some of the biggest challenges in making this film? The biggest were the logistical issues: we shot in an area quite removed from the city, and there was no budget to move the crew to temporary housing close-by. So there was, at the least, a two-hour drive to location everyday. This meant less time, more tired cast and crew, and more stress. Shooting car scenes as well, took a lot of time, because we would have to find the right spot, shoot the scene, and if necessary go back to the beginning spot to shoot again. But since it was a mountain road, it was not possible to U-turn; we had always to keep driving until we could, which could be quite far away. All these take time off from shooting; apart from being a scheduling problem, it also meant that the rhythm and momentum of working was interrupted again and again – luckily, I was surrounded by colleagues of integrity and professionalism, who worked hard to see the film through. Take us through some of the interesting things that happened in your production. 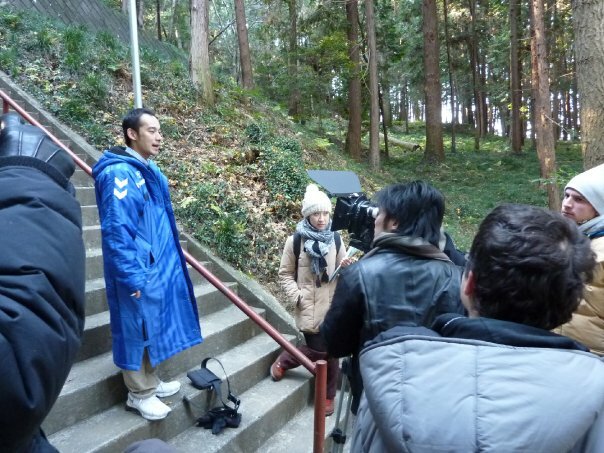 There is this scene in the film, when Kenji hears his Ka-san call out to him at the far end of the cemetery. 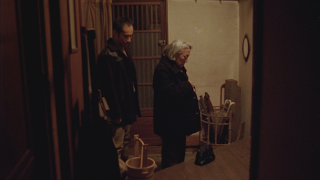 After the shoot, at dinner with the cast and crew, Asada-san (who plays Kenji), told me that we had shot that scene, in the very cemetery where he had discovered that his own mother had collapsed. It was a special revelation- when things like that happen you always feel like it is bigger than mere coincidence. What I remember most about the shoot, was the very last day- when we shot the field scenes on the mountain. 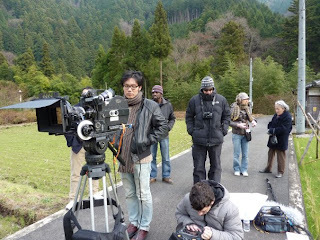 We were shooting the last scene in the schedule, and did not have a lot of time to do it. The mountain was four hours away from Tokyo city, and there was not a lot of daylight because the sun set behind mountain; it would be dark by three-thirty in the afternoon. So we were down on the field and had to shoot a motorcycle driving past, situated several kilometres away; the sun is touching the tip of the mountain, we had fifteen minutes of daylight. We rushed the first shot, and it didn't work- had to do it again. 10 more minutes of daylight. For some reason, the road suddenly had frequent cars passing by, which would have made the shot unuseable. We waited, but it wouldn’t subside - it was tense; the sun was setting. All this while though, some kilometres away, there were men doing road works, and they were packing up for the day. My producers had a brainwave and asked if they could help: they gladly agreed, and put up road cones for us, and started to regulate the traffic! So, we rolled the camera, and took the shot. It worked. When it came the time to call wrap, I had to shout because a lot of the crew was on top, at the road; so my voice literally echoed in the mountains- it was met with cheers, hugs and some tears; we were all so tense, like a coiled spring, that when we finished, there was real joy and relief. That was one of the most special moments for me; on a winter mountain, the cast and crew hugging and congratulating each other at the end of the shoot. It is special when a group of individuals are united in a purpose like that.